I've got a category with two sub-categories, the articles appear to be grouped in the back end by sub-category and it doesn't allow me to set the article order to mix them. Is this normal? It's not how I understood it to work. Is there a setting that allows me to set an arbitrary order? This means in the front end that I see articles sorted by article order within category, even when I set category order to no order in the menu. and find there Article Order - Oldest first, or setup other settings would you like. One possible workaround is to use the Featured Articles feature. 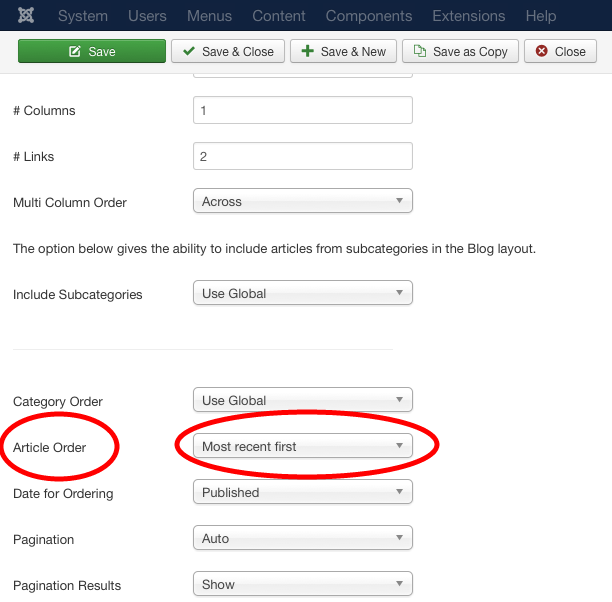 You can set your articles as featured from any kind of category and then use a Featured Articles menu item to display with your desired featured articles order. Not the answer you're looking for? Browse other questions tagged joomla-3.x articles com-content category category-blog or ask your own question.